Barry Dalal-Clayton first saw Kilimanjaro from the ground in 1973 when camping in Amboseli National Part in <?<span>Kenya. Since the, over the past 35 years, he has seen it many times, from all sides and from above, and always been mesmersied by the beauty of the world’s largest free-standing mountain. Ever since that first morning sight of Kilimanjaro glistening white in the morning blue, standing sentinal over the plains, he has wanted to climb it. But whenever he was near the mountain, he was on work trips or without the right equipment or the time for a climb. So it remained an unfulfilled dream. It was during the summer of 2008 that a firm decision to do the climb was taken as a way of celebrating his 60th year. Though the second half of 2008, we spent a lot of time doing baseline research - finding out about the challenges and dangers, considering which route would be best, reading accounts by others on the internet, investigating what gear would be needed and when best to go, etc. We also agreed that we would first do a preparatory climb on the nearby Mt Meru, close to Arusha The eastern half of the mountain blew away a long time ago in a massive explosion, leaving a crater half way up. What remains on the western side is the world’s highest cliff face. 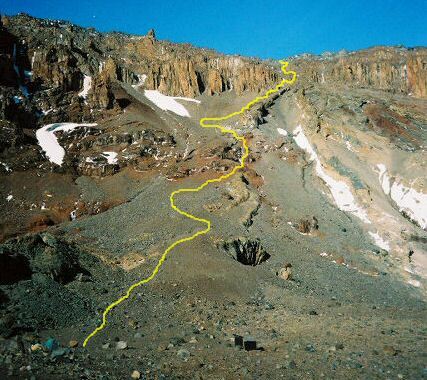 Meru is not as high as Kilimanjaro (14,976 ft) but is a more technical climb and far more exposed with severe vertical drops to either side of the ridge ascending to the summit.